The federal government is charging that Peter Egner is a Nazi war criminal. His friends in West Linn cannot believe it. It came as a shock to them last week when the Department of Justice issued an announcement that it is requesting that Egner’s citizenship be revoked for lying about his service with a notorious SS mobile killing unit. 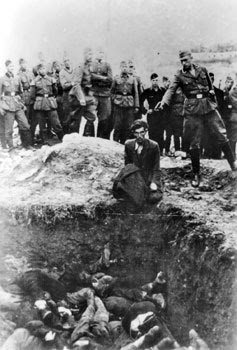 The charges listed in the DOJ complaint are of the utmost severity: During Egner’s service in the organization in 1941 and 1942, the Einsatzgruppe was responsible for the deaths of more than 17,000 Serbian civilians – Jewish men, women and children, communists, suspected communists and Gypsies. To Egner’s friends in West Linn, where he lived from 1981 to 2006 before moving to Bellevue, Wash., this war criminal description does not fit. “When I heard about it I didn’t believe,” said Russell Wilson, who lived in the same West Linn condominium complex as Egner for 15 years. “The Peter I know would not do such a thing as this.” Wilson, a World War II Navy veteran, said he never talked about the war – or even politics – with Egner during their frequent conversations in the complex parking lot. Increasing Anderson’s alarm for Egner is that at age 86 he may lose his citizenship and be deported back to Serbia, possibly to stand trial for war crimes. Egner has been a U.S. citizen since 1966, according to the DOJ. “I can’t think they would do that to an 86-year-old man,” Anderson said. “It would be a shame to deport such an elderly man.” However, to Aaron Breitbart, a spokesman for the Simon Wiesenthal Center, which tracks suspected Nazi war criminals hiding in the USA and other nations, age has nothing to do with prosecution for war crimes. “We want to say, ‘No matter how long you avoid detection, someone will come looking for you.’ That is what this case is all about.” Breitbart said that for years former Nazis or their collaborators benefited from the Cold War era, in which the U.S. refused to accept evidence of their war crimes from the Soviet Union. Egner’s attorney, Robert Gibbs, told newspapers in Seattle that Egner denied participating in persecution of prisoners. Gibbs also maintained that the DOJ charges against Egner were confusing. However, Egner did admit in 2007 to federal officials that he served as a prison guard with the Einsatzgruppe. The reason why is a thorny question for Egner’s friends. “Peter was probably 16 or 18 when Hitler came in,” said Anderson, “and like most of the Germans back then he probably thought Hitler was pulling them out of a big mess. He was probably inducted by the army, where you had to do anything they told you to do or else they would blow you away. Especially over there in Germany. The Egner case could take years to be settled. It has been assigned to U.S. District Judge James P. Donohoe in Seattle, where it will move through the litigation process. The Egner case is one of 14 investigations of suspected Nazi war criminals living in the U.S. now being pursued by the DOJ’s Office of Special Investigations.